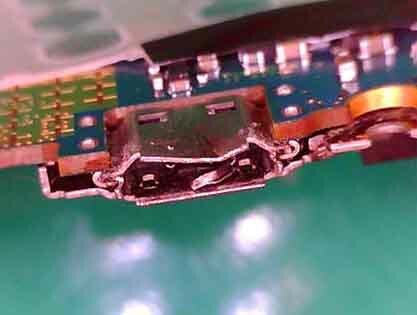 In this post, we seek to resolve Samsung Galaxy S4 that is not charging or has a damaged connector, which hinders the flow of current from the charging unit to the device. But before we present our recommendations / solutions, here are emails from our readers that best describe what the problem is all about and how it happens. 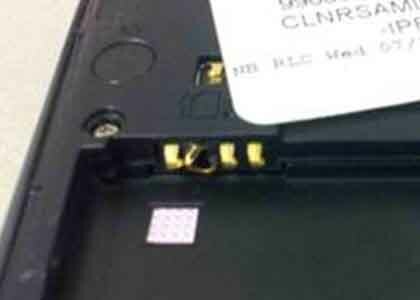 This photo shows a battery connector is bent, which could cause charging problems. My phone (SGH-1337) used to be able to connect via USB (MTP) but is no longer is recognized. The only thing that happens while connected to a USB port on my computer is charging. Also, AC charging is not recognized and the phone reports USB charging rather than AC when using the provided charger. Therefore it only charges at 460mA (USB max amperage) rather than the full 1900mA (factory OEM 2A charger). I suspect something is wrong with the microUSB, or the update that at&t did modified the kernel and messed everything up. I have accidentally let the battery go down to 0% only 2 times, and it has overheated some times before (which may have created some corrosion internally but I think it's unlikely). I have already done a factory reset to yield no results. I have the Samsung Galaxy S IV on T-Mobile. I received a small software update on June 3rd and ever since then my phone will not charge at all with a longer charging cable including the one that came with the phone. I have to use a small cable in order for it to charge normally and it is very annoying. I am running stock android 4.1.2 from Samsung. I believe that it is a software issue with the phone since it was right after that last update. Have you ever heard of this problem? If so do you have any solutions? l have a Galaxy S4. But now from 2 or 3 days I am facing a problem of slow charging. Last night in 7 hours it charges only 30%. Please tell me reasons and solutions. · Using non-approved enhancements such as a battery or charger. · Your device can become warm during long calls, when charging, or using data. · The device has experienced some type of physical damage. Important Note: Excessively hot is defined as too hot to keep in contact with skin. If you feel this is the case, discontinue using the device and send it in for evaluation. Verify that you are using all Samsung original equipment and not a third-party battery or charger. If possible, try using a different OEM/Samsung battery or charger. If another battery/charger does cause the same issue, the original battery/charger will need to be replaced. To determine if the device has experienced liquid damage you can check the LDI (Liquid Damage Indicator). The LDI is located inside the battery well and on the battery itself. LDI indicators should be solid white or white with visible pink/purple X's (view an example). If the device has been exposed to moisture, the LDI will be solid pink/purple/red (view an example). Your device will need to be sent in for repair. Liquid damage is not covered under the Samsung Limited Warranty. The photo shows a totally damaged connector that could lead to charging problems. When your phone has a damaged connector, there is nothing much we can do about it. The device has experienced some type of physical or liquid damage. Your device will need to be sent in for repair. Physical damage is not covered under the Samsung Limited Warranty. We have an email that we used to receive questions, problems or suggestions from our readers. If you think you have some problems with your phone that you cannot resolve on your own, or you don't know how to fix them, send us an email at sebertech@gmail.com and we will do our best to find solutions for you.